The star of new movie King Arthur: Legend of the Sword has told of being “very excited” when told scenes were to be shot in the Scottish Highlands. Locations for the Guy Ritchie-directed movie included near the Bealach na Bà, a pass in Applecross, and Devil’s Pulpit, near Killearn. Read it on the BBC News website. A woman who left New Stevenston more than 50 years ago to pursue a nursing career is trying to reconnect with some childhood friends. Betty Astle moved from Newarthill to Wrangholm Drive during third year at Dalziel High and became good friends with Theresa McDaid and Ray Reid before beginning her training at Killearn Hospital in 1962. Read it on the Motherwell Times website. Over 50 people don’t want the historic former Black Bull Hotel in Killearn to be bulldozed to make way for flats. A total of 57, out of 61, are opposed to a planning application for 17 flats on the site. Read it on the Milngavie Herald website. A heartbroken Stirlingshire family have consulted dog behaviour experts in desperate bid find their missing pet. The McArthur family’s two-year-old working cocker spaniel Maisie disappeared on her walk at the end of March, having last been seen in a field between Killearn Glen and Drumbeg Loan. A distraught family are looking for help to find their beloved pet dog Maisie, who has been missing for three weeks. 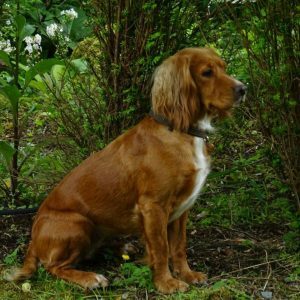 The McArthur family’s working cocker disappeared on her walk in Killearn on a sunny Monday morning at the end of March. If you have any information go to the Facebook page at www.facebook.com/findmissingmaisie/. The campaign comes in the run-up to the release of the Guy Ritchie film King Arthur: Legend of the Sword in May. Scenes from Scotland in the movie include the Devil’s Pulpit, near Killearn, and The Bealach at Applecross. Sir Arnold Clark, the founder of Britain’s biggest independent group of car dealerships, has died at the age of 89. The billionaire was born in Glasgow, where he set up his first showroom in 1954 after leaving the RAF. A new guide has named 12 locations in Scotland in its list of the best places to live in Britain. Killearn was named in The Sunday Times Best Place to Live list. Read it on the stv news website. Almost 100 people have joined a facebook group called “Save the Black Bull” in a bid to save the Killearn Hotel building (formerly The Black Bull Hotel). Plans have been lodged by a developer with Stirling Council to build residential apartments on the site. Police have issued an appeal after a teenager was reported missing from Killearn. Courtney Leonard, 16, was last seen at around 7.30pm on Monday when she boarded a bus from the village to Glasgow. Read it on the Daily Record website.